We are so happy to feature Tia Fulford in our Patient Spotlight, the mother of a Peconic Pediatrics patient and a Riverhead native who started the organization The Butterfly Effect Project. Fulford’s organization helps fund girls to become Girl Scouts when they cannot afford the dues. At the age of 10, Tia became involved in a similar program to the one she would later end up founding, which paired her with an older woman, who became her mentor. This woman would teach her the joys of reading and creative expression as well as serve as an inspiration for giving back. It all came full circle for Fulford in November when, after attending a badge night at her girls' Girl Scout troop, she noticed that girls who hadn't attended meetings received badges, just because their parents had paid, while other girls received none, because they couldn’t afford them. That pivotal moment at the Girl Scouts meeting prompted Fulford to take a stand toward change and found The Butterfly Effect Project. She specifically chose this name because of what it signifies; a symbol of transformation and overcoming one’s circumstances. Fulford has said that her mission is to inspire young girls to reach for new heights and bright horizons. Each week the girls of the Butterfly Effect organization learn life lessons, such as respect for elders, working hard in life, tolerance, not to envy, how to write thank you notes and the importance of education. The girls enjoy a series of free trips and enjoy arts and crafts as well as give back to others in need. 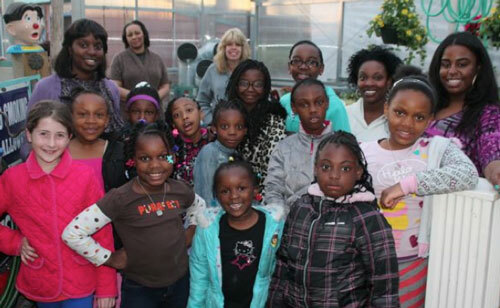 The Butterfly Effect Program started with 10 girls and is now up to around 17 and growing. The group meets bi-monthly at the Riverhead Free Library. From all of us here at Peconic Pediatrics, thank you Tia for being such an inspiration!